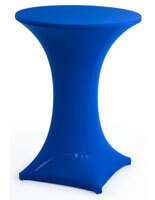 Do you need round table covers to use on your tabletops in a dining room or for an outdoor event? 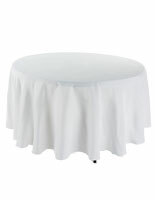 The polyester circular tablecloths are ideal party supplies for many occasions because they come in versatile colors, like white and black, and are available in several different diameters. 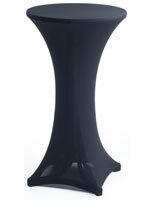 There are two types of tabletop linens sold, some fit standard rounds and others are fitted for bar-height dining furniture. 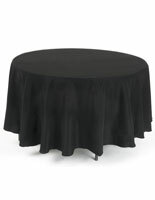 The round table covers, such as circular tablecloths, are able to be used in many locations both indoors and outdoors. 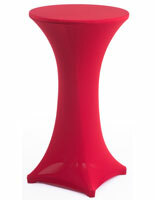 Polyester has many benefits too, not the least of which are that the cloths are machine washable and wrinkle free for easy care party decorations. 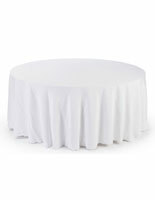 These affordable circular tablecloths are a great choice for any business that needs formal looking coverings for events that they oversee or that occur in their space. 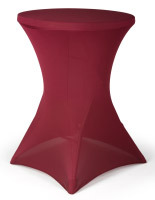 The round table covers for restaurant patios are even sold as custom skirts, fitted cloths for bar height tops, which is a great advertising opportunity. 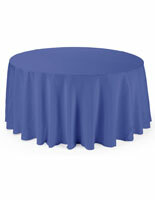 What diameters and colors are sold in these circular tablecloths? 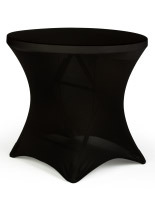 These round table covers serve different tabletop diameters depending on whether or not they are fitted. 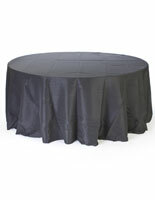 The flowing tablecloths are sold in diameters of 7.5', 9', 10' and 11' to fit varying sizes of rounds. 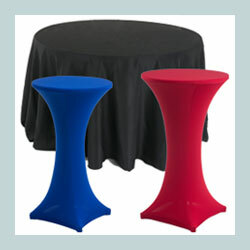 These coverings can be used as floor length or chair length party supplies. 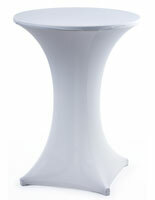 The fitted linens are designed for bar-height furniture and fit tabletops with 23.5", 27.5" or 31.5" diameters. The custom printed skirt is designed for a dining surface that is 27.75" wide. 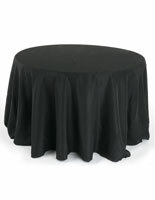 The round table linens, fitted or not, are available in colors of black, white and royal blue. 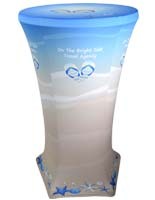 The flowing covers are also sold in ivory and gold in certain diameters. 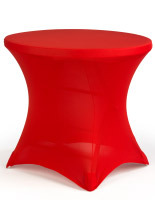 The spandex tablecloths are sold in red to really get noticed at a party. 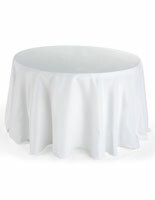 Many businesses will find these round table linens useful and cost-effective additions to their party supplies. 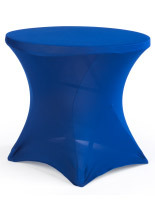 These polyester covers are typically used by restaurants, hotel, and convention centers to add a bit of class to their dining facilities. 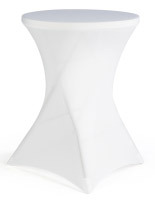 Bars and other businesses that have outdoor social or eating areas don’t have to worry about using these linens on their patios. Both the relaxed and fitted versions can withstand a bit of rain without being ruined, unlike paper or other more expensive fabrics. 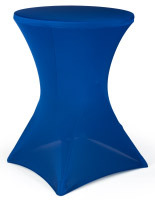 Both custom skirts and plain cloths that fit bar-height tabletops are great for clubs and caterers that are hoping to get a lot of use out of them. 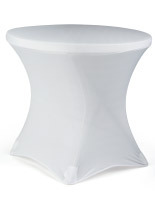 These coverings have pockets for the table feet sewn in to prevent ripping of the fabric. 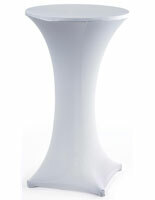 Of course the flowing party linens are also durable and are designed for frequent use with their easy care regimen!